Santisuk Klongchaiya, CEO of Thai AirAsia, said the airline has devoted great importance to adding routes to its regional flight bases, looking to build a strong network of destinations that provide the opportunity to add even further routes, providing ever greater convenience to travellers who will no longer need to stop over in Bangkok. “Phuket is a very important strategic flight base for AirAsia that has grown steadily along with the addition of direct flights to CLMV cities such as Siem Reap. With the positive response we have received from international travellers, we decided to add Phuket-Phnom Penh, connecting the resort town to Cambodia’s capital. The route should well serve tourists as well as members of the business community of both countries,” Santisuk added. Phuket-Phnom Penh, available 4 times a week (Monday/Tuesday/Friday/Saturday), will begin operation on 1 June 2019 and has already received considerable attention among international flyers. The route connects two of ASEAN’s top tourism destinations and provides the people of Phuket an easy way to travel to Cambodia’s economic centre, along with its nearby neighbors. The route is being debuted with a promotional fare starting from only THB 990 one way. Book between 1 and 14 April 2019 for travel from 1 June-26 October 2019. Check updated fares and book at airasia.com or other ticketing channels. For the latest news and promotions from AirAsia, visit the airline’s Facebook (facebook.com/AirAsia) and Twitter (twitter.com/AirAsia). 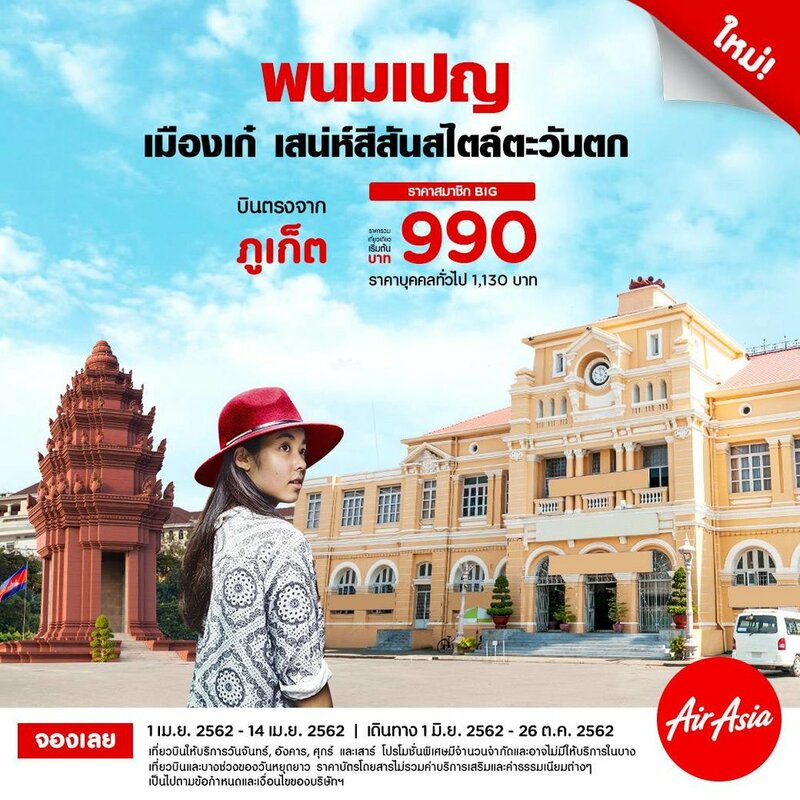 Thai AirAsia operates 9 international routes out of Phuket; Phuket-Wuhan, Phuket-Kunming, Phuket-Hong Kong, Phuket-Macau, Phuket-Siem Reap, Phuket-Singapore, Phuket-Kuala Lumpur (Code AK), Phuket-Penang (Code AK) and the latest addition Phuket-Phnom Penh.